A mom and daughter are at the kitchen counter. They're preparing to bake something. 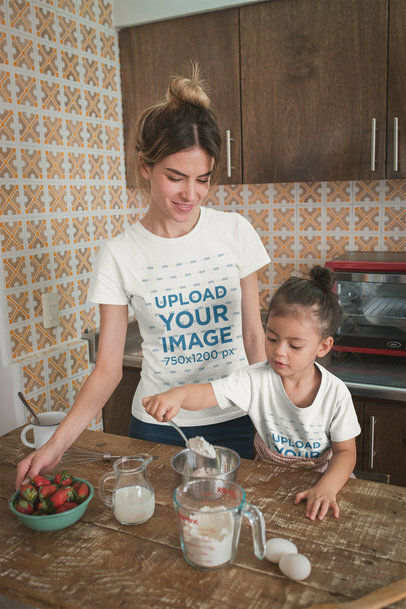 The woman is reaching for a bowl of strawberries while the child has a spoonful of flour. They're both wearing white shirts with their hair up, and look happy. The kitchen is brown with patterned wallpaper. There is also two eggs and a small pitcher of milk on the counter. 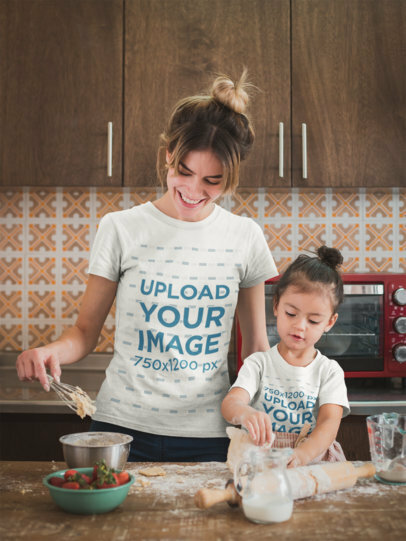 Promote your parents with kids' t-shirt designs with Placeit's mockups! A mom and daughter are standing at a kitchen counter with a rolling pin and dough in front of them. There is flour all over the countertop with a measuring cup and bowl. They are wearing t-shirts with different designs for parents with kids. The mom is standing behind the girl and smiling while looking down at her daughter. There is a colorful orange tile wall behind them. The counter is messy with the flour and dough. 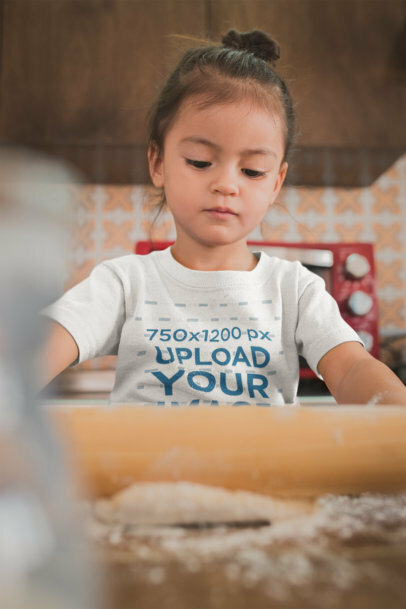 Use now this beautiful visual featuring a girl learning how to bake while wearing a t-shirt, it's a super cute visual that you can use if you want to market your designs in a better way! Use the HEX tool on the right to choose a color for the garment, then drag-and-drop your design image file over the upload button on the left. Try another T-Shirt Mockup! 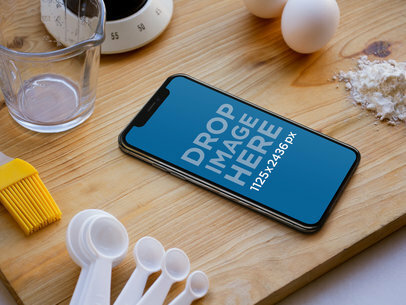 Have a look at this awesome iPhone X lying on a kitchen counter, near cooking and baking supplies. 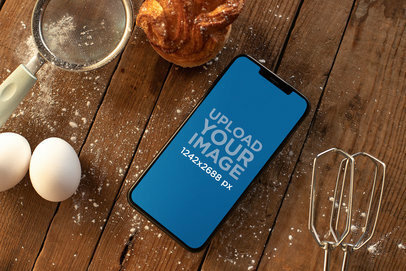 You can use this beautiful iPhone X mockup to promote your latest cooking app or wesbite in a really easy way! You just have to drag-and-drop your screenshot image file over the interface or capture a website screenshot with the Screenshot from URL button. A professional tool like this was never so easy to use! 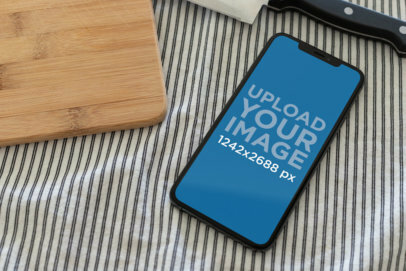 Try another iPhone X Mockup! Here's a super fun mockup from Placeit. 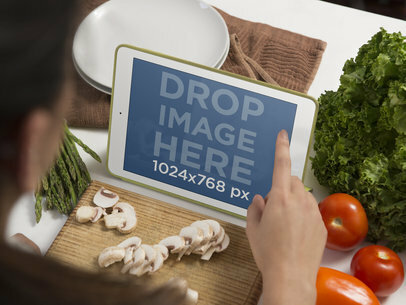 It features a young woman standing in front of her White iPad standing in landscape position while preparing something tasty in the kitchen. Making this scene perfect to showcase your new iOS app that involves cooking/baking. For example, perhaps you have an app that provides the user with creative new recipes or streams cooking videos. This scene could also work for an app that allows to chat face-to-face online, so she could be learning a new recipe from her dear grandmother, who lives on the other side of the country. There are a lot of fun possibilities here. The only thing missing from this cooking scene is your iOS app or mobile responsive website. 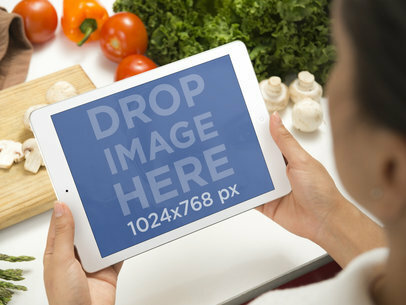 Do you have a new cooking or recipe app and are you new to Placeit's online marketing strategy? Placeit is a fantastic app/website marketing tool, provides you with a to showcase your iOS app within an everyday context, people can relate to. Do you want to know how Placeit can help you? It's simple, you choose the mockup template that works perfectly for your iOS app/website. Then you drag a screenshot from your app and place over the top of the screen in the mockup. Once you're happy with the looks of your mockup, you can download it and you'll have fun marketing tool for your app. Placeit, makes digital marketing quick and painless! Consumers are hungry for fresh, new, inventive products. Let’s check out what your new iOS app is serving up. 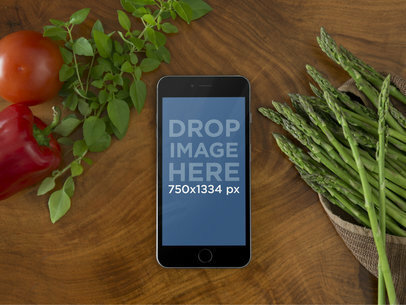 This black iPhone 6 rests atop a natural wood kitchen chopping block, amid colorful vegetables, at an angled portrait position. This template is fresh and organic just like your newest app. Your target market is hungry and cannot wait to see what you’ve cooked up for them. 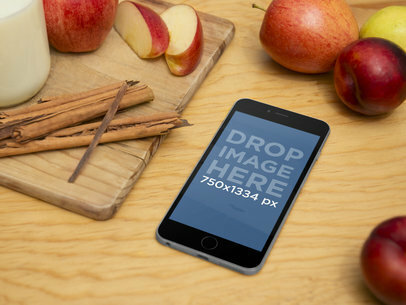 Get back to marketing basics with this Placeit iPhone 6 mockup template. Mockup are so easy to create. Simply drag and drop a screenshot of your own app onto the iPhone's screen or type a URL above. Placeit will automatically adjust it and make a winning image out of this template. Your customers will eat it up. Don't miss out of the raw genius of this template. All that's missing is your app or website so get started today. Don't just stand there watching that pot of water boil, get it to and take your marketing strategy to another level with Placeit templates. 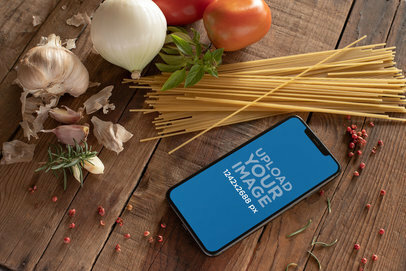 Looking for a way to promote your fun iOS cooking app, a blog that provides amazing recipes, a website that allows people to stream cooking videos or a new social app that allows the user to share what they're doing? If you do, then checkout this mockup from Placeit. This scene features a young woman, about to prepare something yummy. 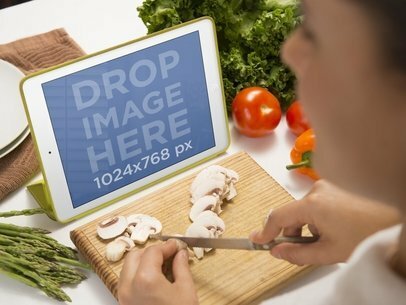 She's surrounded by fresh ingredients, but it's the large screen of her White iPad Mini in landscape position that steals the show. Only thing missing is your website or iOS app. 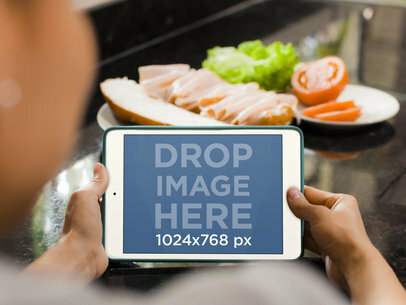 You simply need to drag a detailed screenshot from your site onto the iPad's screen and download this mockup, then you've created an amazing marketing tool for your site. Pretty cool, right? See more iPac mockups here! Do you have a fun cooking iOS app? How about a blog that besides being mobile responsive, provides amazing recipes? Perhaps a web app the allows people to stream videos, including their favorite cooking shows? Or a new social app that allows user to share what they're doing? 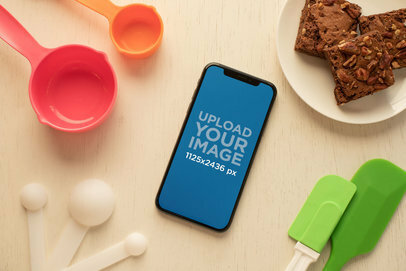 If so then why not use this fun mockup from Placeit, to help promote your product? This scene features a young woman preparing something delicious in her kitchen, surrounded by fresh ingredients. But it's the large screen of her white iPad in landscape that steals the show here. 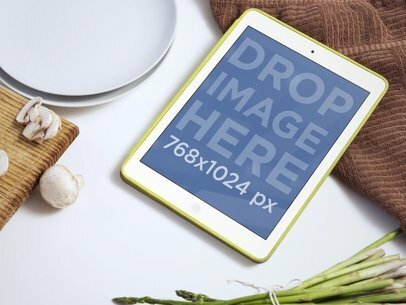 All you need to do is download this mockup and drag a detailed screenshot from your site, onto the iPad's screen, and ta-da! You've just created an amazing marketing tool for your site. Pretty easy, right? 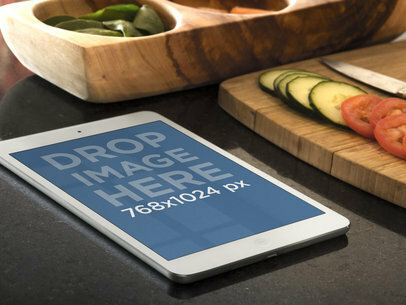 An iPad rests on a kitchen counter with a spread of baking ingredients around it. To the left of the iPad there is a pair of eggs and a glass bowl. To the right a plate with sticks of butter and a bowl of flour. The iPad is in landscape mode and holds a mockup image of 1024x768px. This is the perfect place for a great recipe app or for the lovers of cake and cupcakes. If you’re looking for a scene to sell your cooking app, then look no further! This iPhone 6 mockup also works for a fun photo sharing app. Or you can use this mockup for your reading or gaming app. The sky is the limit with this creative scene! 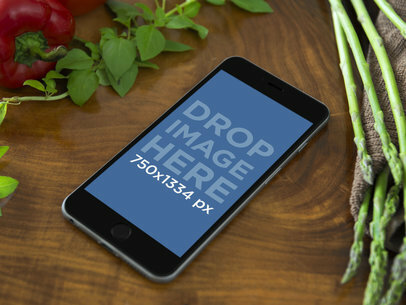 In this mockup, we have a black iPhone 6, laying in portrait position just waiting for you to place your own screenshot! 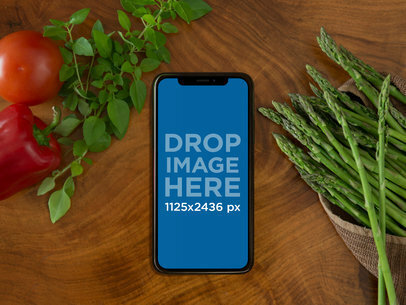 All you need to do is simply drag and drop your screenshot over the iPhone’s screen and then download this amazing iPhone mockup from Placeit, then you’re all set! Your app isn't just for those who have conventional business on their minds- it's also for those who are hard at work for their families and friends. With such natural surroundings, the black iPhone 6 in portrait position here provides a stark contrast that will immediately draw a client's eye. Associate your iOS app with the warm and sentimental feelings of autumn in this mock-up template, and customers will not only remember your product, but also think of it fondly. Let's make prospective purchasers feel at home and happy! Drag and drop a screenshot of your work onto the iPhone's screen or upload an image by selecting "Grab Screenshot From URL" above the template and typing your URL when prompted! 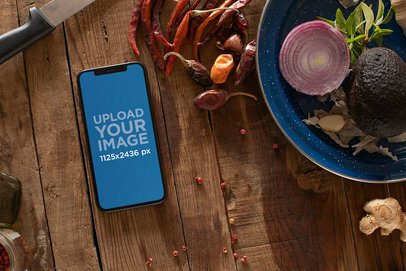 Smiles all around with this iPhone 6 mockup template on a cooking environment. See more iPhone mockups here! You can use this iPhone 6 mockup on a kitchen counter with cooking supplies to show off your new cooking app. This is great for the handy Martha Stuart mom. Or to show off an app that will teach use how to make turkey dinners. The iPhone is set to portrait view and will hold an image of 750x1080px. 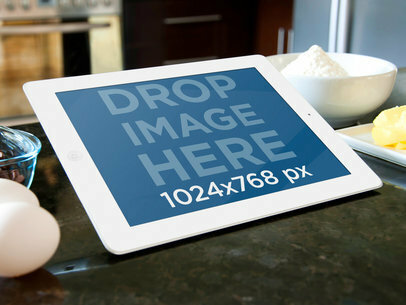 Place your product screenshot on this white iPad in the kitchen. Your target audience could be anyone to do with food, and that&#8217;s a lot! The mockup stage is lying on top of a granite kitchen counter. Next to it is a cutting board with sliced tomatoes and cucumbers. A knife lies ready to use. At the top of the image is a wooden, triple portion bowl with carrots and baby spinach. The iPad is at portrait orientation and a right angle. Your image will appear in this 768 x 1024 px stage.